Gate 777 Casino is one of the more unique destinations for gamblers these days. They are known for having great bonuses and promotions, as well as being a safe casino to gamble in. They have an SSL encryption, and they have a seal of approval from eCOGRA, which means their games are proven fair by them. Read our gate777 review now. Casino bonuses, in general, are always something to look forward to when signing up at a new website for gambling. They come in all shapes and sizes, but there is no doubt that some casinos certainly have one or more bonuses that stand out from the others on the market. One of the casinos that have a bonus like this is Gate 777. Normally they have a really good welcome offer for new users, but at the moment they have a special promotion that will make you wanna sign up right away – don’t get us wrong they will still have a great offer after this one expires. The reason why they have a special promo right now is that it is the beginning of the new year (2019), so they thought they might as well kick it off with something awesome that keeps players entertained for hours on end, as well as making them smile – a lot! Before we let you know what the bonus contains, it is worth mentioning that the casino also has other promotions that are worth checking out. And after we have talked about the Special New Year Bonus, we are going to mention some of them for you. We would find it pretty weird if you get disappointed after hearing what they are all about. The Special New Year Bonus matches your first deposit with 100% up to a total of €200. You will also get something called 100 Extra Spins on a slot called Bust the Bank by the famous developer called Microgaming. It probably does not come as a surprise that a wagering requirement needs to be met when it comes to welcome bonuses. The same goes for this bonus. You will need to wager both your deposit and the bonus money 30 x on any slot game for real money. After this has been done, you will be able to withdraw any funds left – as long as it is above the minimum amount for withdrawals. There are also other rules that you should be aware of if you decide to use the Special New Year Bonus. For example, not all of the games at Gate 777 contributes the same towards the requirement, so be sure to check that out. Also, you need to deposit €20 or more to qualify for the bonus, and you can’t bet higher than five euros per round/spin. Something that’s pretty awesome is that you can still get bonuses on the three next deposits in the casino, after using the Special New Year Bonus of course. The second one gives you 25 Extra Spins on Aloha! Cluster Pays when depositing for the second time. The bonus is like this: 50% match bonus up to a maximum of €200. The third one gives you 25 Extra Spins on Fruit Shop when depositing for the third time. The bonus is like this: 50% match bonus up to a maximum of €300. The fourth one gives you 25 Extra Spins on Gonzo’s Quest when depositing for the fourth time. The bonus like this: 25% match bonus up to a maximum of €300. To say like this, there is no doubt that you will be entertained for a long period if you decide to use the Special New Year Bonus and the other three welcome bonuses! As we said earlier, we were going to mention a few promotions that Gate 777 have on offer. One is called Daily Upgrades, where you will get a surprise every single day! Another one is Weekend GateAway, this one gives you 30 Extra Spins every weekend! You can expect a lot when using their mobile platform. It is fully optimised for small devices, so there is no doubt that you will have a great experience using it. Most of the games are available, and the website, in general, looks great on them! Most of the payment methods used in the casino industry are available at Gate 777. Some of the most used methods are Visa, Skrill, MasterCard and Neteller. You can also use Paysafecard and others. You will be happy to hear that deposits are instant and withdrawals are quick. You cannot deposit less than €20, and the withdrawal limit per week is €5000. 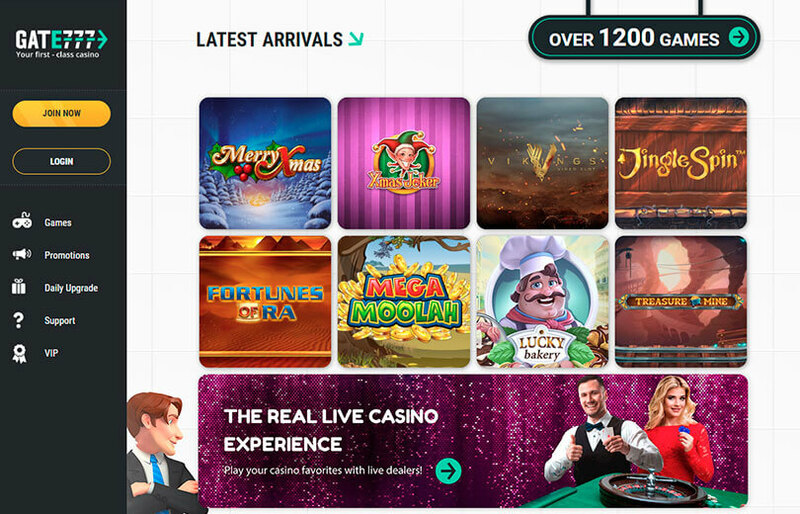 When Gate 777 started their casino journey, they didn’t have a live chat, but that has changed. This means that you can now contact the casino around the clock whenever you need it. But if you prefer to use more old-school ways of contacting a casino, then you can either call them or send them an email. Of course, you won’t get a reply through email as fast as you will from live chat, but it’s still a great option to use. A good thing about phone support is that it is toll-free. Gate 777 has hundreds of games from many well-known software developers. A few of them are Play’n GO, NetEnt, Microgaming and ELK Studios. A couple of popular games are Starburst, Warlords: Crystals of Power and Jack Hammer 2, Jack and the Beanstalk. Also, you can play all kind of table games and enjoy the live casino. There is no doubt that you will be entertained for hours on end if you decide to create a user at Gate 777 Casino. Something that we really like about it is the design. They have plane travel themed website, and it looks awesome. The name Gate 777 is, in a way, the gate you need to go to when you’re travelling by plane. Their animated characters and graphics makes it all even better. Kudos to them for the design in general. Hopefully, you are going to a gate as well after winning loads of money in the casino. Before you know it, you are on a well-deserved vacation somewhere in the world! But first, you have to make a deposit, and why not use the sign-up bonus to give it a go! If you decide to create a user at Gate 777, you won't be disappointed. They have a super welcome offer and great promotions. You can expect to play loads of different games, and new ones are being added regularly. Customer service is great, and the payment options are good. Most important of all is that it is a safe casino to play in!